Kofi Kingston, Big E & Xavier Woods kick off 2019 with their resolution and a look ahead at the first SmackDown LIVE of the year. The Charismatic Enigma and The Samoan Submission Machine continue their heated rivalry, as the two battle to become the final Superstar in the Fatal 5-Way Match for a WWE Championship opportunity. After punching Mr. McMahon last week, The Phenomenal Once gives a brazen response when Mr. McMahon looks for an apology. The King of Strong Style crashes Rusev’s United States Championship celebration, and after a fight breaks out, Lana tries to come to her husband’s rescue. Naomi is prepared for a match against Mandy Rose, but The Golden Goddess has other plans. The IIconics, Gallows & Anderson and Shelton Benjamin share their hopes for 2019 with the WWE Universe. The 16-time World Champion returns to the blue brand, only to quickly find out that The Man runs things now. John Cena joins forces with The Man to take on Andrade Almas & Zelina Vega in a mixed tag team battle. The A-Lister meets up with his new tag team partner to go over ideas for matching ring gear. Becky Lynch, Charlotte Flair and Carmella all state their case to Triple H as to why they should challenge SmackDown Women’s Champion Asuka at Royal Rumble. The King of Strong Style isn’t finished with Rusev or the United States Championship. After teaming up with Becky Lynch, the 16-time World Champion gives his stamp of approval to The Man and tells the WWE Universe what they can look forward to from him in 2019. 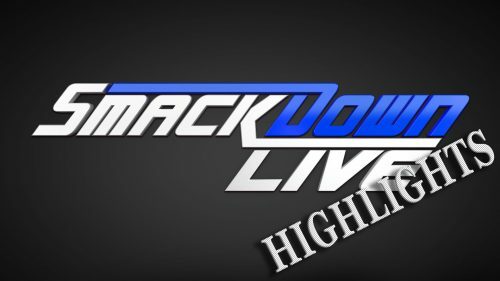 Five of SmackDown LIVE’s top stars square off in a huge Fatal 5-Way Match, with the winner receiving a WWE Championship Match at Royal Rumble.